We’ve covered the creatively deranged work of YouTube celebrity and inventor Colin Furze before: He’s the guy who strapped a jet engine to a go-kart and lived to tell the tale, and he spent the last few years using ceiling-walking magnet shoes and retractable claws to emulate the powers of various X-Men mutants. He also recently made headlines by setting off a “Death Star” of fireworks, in a legitimately beautiful display of stupid, enthusiastic excess. Now Furze is back with another entry in his X-Men project, this time focused on original team member Bobby Drake—a.k.a. Iceman. 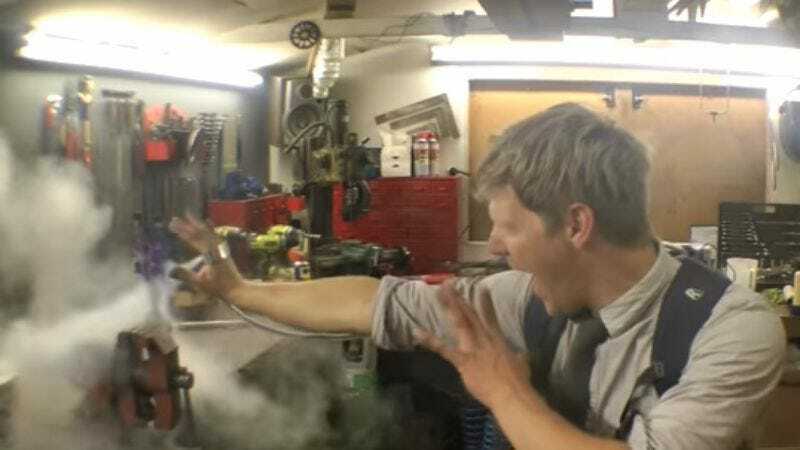 In a sort of sister video to the Pyro video he posted in May 2014, Furze has assembled a set of hand-mounted pressurized liquid nitrogen blasters, which he deploys liberally as he runs around his workshop, giddily covering everything he can in a thin layer of ice. The ice shooters aren’t quite as flashy as some of Furze’s other projects—like his recreation of a Doof Warrior-esque flame guitar or his ludicrously unsafe hoverbike—but it’s a testament to his enthusiasm for “science” that he still makes it look so cool.